​Joseph Henry Gervase Peters came up to Jesus College in October 1913, having attended Winchester College and aimed to read the Mechanical Science Tripos. 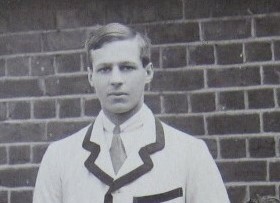 There is little information on Peters’ short time in College but he was a member of the Jesus College Boat Club, and rowed in the second boat in the Lent races, where his recorded weight was 10st 10lbs, and the third boat in the May races. Peters is recorded on both Jesus College War Memorial and in The War List of the University of Cambridge 1914-18. The obituary for him in the Jesus College Cambridge Society Annual Report 1920 details his military service. He joined up at the outbreak of war and received a commission to the Buffs and was then wounded in Mesopotamia. After he had recovered he received a permanent commission to the Indian Army in 1917. He was promoted to Captain in 1919 and proceeded to the North Western Frontier in September, where he was killed in action. (Annual Report 1920, p. 21). He is commemorated on the Delhi Memorial in India.